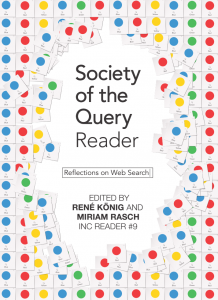 After co-organizing the Society of the Query #2 conference I had the chance to edit a related book with Miriam Rasch as part of the Institute of Network Cultures´ exciting reader series. It´s out now and it´s completely open access! Read it online, download it or order a copy for free here. About the book: Looking up something online is one of the most common applications of the web. Whether with a laptop or smartphone, we search the web from wherever we are, at any given moment. ‘Googling’ has become so entwined in our daily routines that we rarely question it. H owever, search engines such as Google or Bing determine what part of the web we get to see, shaping our knowledge and perceptions of the world. But there is a world beyond Google – geographically, culturally, and technologically. Dieser Beitrag wurde am 2. July 2014 von RKoenig in English publications veröffentlicht. Schlagworte: english, Google, publications, search engines.